Tropican Alternative Formula has been developed for birds that need a little more or less than the Lifetime Formula. The proteins are from pea and quinoa. No corn or soy in this mix. It is great for birds that need to lose weight, older birds, birds that need something easier to digest and birds that need additional variety to the pellets that they are currently eating. It contains bentonite clay for digestion. Wheat germ oil for healthy skin. Natural antioxidants. The pellets are 4mm, so they the right size for medium sized conures to macaws. 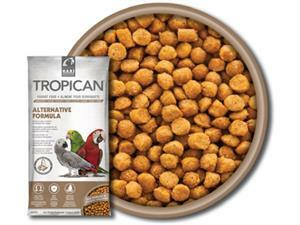 Tropican Alternative Formula is fortified with vitamins and provides a complete diet. Ingredients: Wheat, brown rice, pea protein, dehulled peanuts, sweet potato, pumpkin seeds, canola oil (preserved with mixed tocopherols), dehulled barley, montmorillonite clay, dried tomatoes, calcium carbonate, dicalcium phosphate, quinoa, yeast culture, maple sugar, cranberries, dried kelp, flaxseed, lecithin, walnuts, marigold, L-lysine, choline chloride, DL-methionine, green tea extract, salt, wheat germ oil, beta-carotene, vitamin E supplement, biotin, niacin, calcium L-ascorbyl-2-monophosphate, zinc oxide, manganous oxide, algae meal, d-calcium pantothenate, vitamin B12 supplement, riboflavin, rosemary extract, copper sulfate, pyridoxine hydrochloride, thiamine mononitrate, inositol, folic acid, vitamin A supplement, calcium iodate, sodium selenite, vitamin D3 supplement. Guaranteed Analysis: Crude protein (min.) 15%, Crude fat (min.) 9%, Crude fiber (max.) 8%, Moisture (max.) 10%, Calcium (min.) 0.8%, Phosphorus (min.) 0.6%, Vitamin A (min.) 5,000 IU/kg, Vitamin D3 (min.) 550 IU/kg, Vitamin E (min.) 200 IU/kg, Beta-Carotene (min.) 600 mg/kg.